With all starters and a deep, experienced bench returning, LaRue County High School’s Lady Hawks basketball team is in the driving lane to improve last year’s 14-13 record and perhaps capture its first 18th District crown in six years. “We have experience, size, and versatility,” Travis Wootton, Lady Hawks’ coach, said. The team has set a goal of 22 victories, which would be a season record. Wootton will depend a lot on one of the team’s leaders, senior guard Valerie Whitlock, to help make that dream a reality. 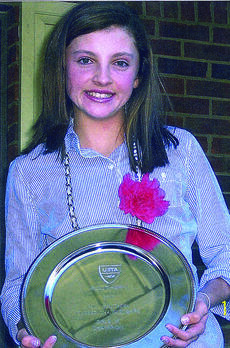 Michelle McKamey, sixth grade student at Lone Oak Middle School in Paducah and a member of the State runner-up Lone Oak High School varsity tennis team, won the girls 12s division at the prestigious Fall Southern Closed Tennis Tournament in Louisville. The tournament was held over the Thanksgiving holiday. The tourney consisted of the top 48 girls representing the nine states that make up the southern section of the U.S.
McKamey, the Number 2 seed, won five matches in a row, without losing a set. She won the championship 6-3, 6-0. The Greater Louisville Football Coaches Association/Drive Cancer Out East-West All-Star Game was played Sunday at Southern High School. The game matched the top seniors from the Louisville area. Two LaRue County High School players, Alex Lee and Austin Shirley, were named to the West team. Shirley, #51, had two tackles on defense. He is shown here receiving the defensive play from the sideline during the game. The LaRue County Hawks boys’ basketball team won its season opener against the Casey County Rebels Dec. 5. Both teams’ shooting matched the cold weather outside as LaRue scored 22 points in the first half and Casey County only scored 11. With two minutes to go in the first half, the Rebels had scored a mere seven points. The LaRue County High School Lady Hawks went 2-1 in the Meade County Lady Wave Tip-Off Classic. Six teams competed in the Friday and Saturday tournament. LaRue’s Ladies defeated Edmonson County, 62-39 and Meade County, 66-48 on Saturday. 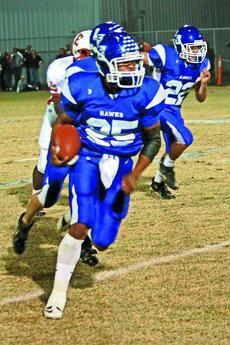 On Friday, LaRue County lost to Russell County, 55-51 in overtime. The Lady Hawks led Edmonson County, 36-22 at halftime before taking control of the game with a 16-8 burst in the third quarter. 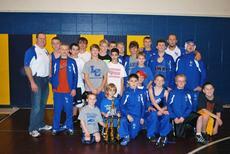 The LaRue County Mat Hawks have won four dual state championships, 11 regional championships and numerous tournament titles over the team's 21-year existence, but the team has never won the overall state tournament title. This is the year the coaches hope will end that drought. On Saturday, the LaRue County Middle School Mat Hawks traveled to Elkhorn Middle School to compete in a 16-team dual competition. The Mat Hawks finished in third place defeating some top teams in the state in the process. Alex Lee, a senior running and defensive back on LaRue County’s Hawks football team, has been named one of 10 finalists for the Army Iron Man of the Year that honors Kentucky’s best two-way high school football players. Lee, 6-1, 205 pounds, earned the week-three Army Iron Man of the Week after rushing for 104 yards with a touchdown and grabbing an interception in LaRue County’s 19-7 win over Shelby County.